Taxiing to and from the airport terminal gate and runway is a major source of CO2 emissions. Aircraft are currently required to use their main propulsion jet engines in a highly inefficient manner for slow speed ground movements; the consequence is greater local air and noise pollution, as well as wasted fuel and hence increased carbon emissions. Ricardo has successfully engineered and delivered a demonstrator robotic, pilot-controlled towing vehicle known as ‘TaxiBot’ for Israel Aerospace Industries (IAI). The TaxiBot concept is capable of operating with both wide and narrow bodied commercial airliners; it requires no modification to the aircraft, taxiways or runways, and only minor changes to airport infrastructure. Ricardo has been working for the past 15 months with IAI to develop the Taxibot concept. After an initial feasibility study, Ricardo developed a detailed programme for IAI to take the concept to the level of a working demonstrator vehicle with full capability. Ricardo’s involvement in this work included requirements capture, conceptual design and detailed specification design, manufacture and demonstration of the first TaxiBot demonstrator vehicle. Following the successful build and initial testing of the first vehicle, IAI has now signed a Memorandum of Understanding with Airbus Industries and a Memorandum of Agreement with international ground support equipment provider TLD, covering the next stages of development of the Taxibot concept. Ricardo was ideally placed to assist with a programme of this nature given the company’s extensive vehicle engineering capability and its multi-disciplinary teams of engineers skilled in areas including computer aided design, modelling, electronics, control systems and all aspects of powertrain engineering. After further testing and development, Taxibot has the potential to play a highly significant role in the reduction of fuel costs and emissions. According to IAI and Airbus, Taxiing at airports using the aircrafts' main engines results in a huge consumption of fuel (forecasted to cost around $7bn by 2012), a large emission of CO2 (approximately 18m tonnes per year), and a significant source of foreign object debris damage (costing around $350m per year). The first TaxiBot vehicle - a full size, fully operational demonstrator – is based on a Krauss Maffei PTS-1 aircraft towbarless tractor originally owned by Lufthansa LEOS. This donor vehicle has been heavily redesigned, modified and rebuilt by Ricardo to install IAI's patented and innovative ideas of a "turret" and energy absorption systems and controls. The key modifications to the base vehicle by Ricardo were the installation of the “turret” to which the aircraft nose wheel is clamped and that can rotate as the pilot steers the nose wheel; a platform that can tilt and move axially; and chassis extensions to the existing vehicle including an additional axle set, enabling the TaxiBot components to be incorporated. 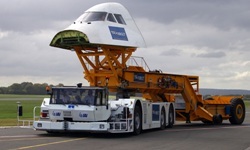 The resulting now six-wheeled vehicle is capable of towing Boeing 747 and Airbus A340 airliners. The demonstrator vehicle weighs 52 tonnes and is powered by twin, 500hp V8 diesel engines which operate a complex hydrostatic drive system as well as hydraulic systems handling the 4-wheel steering and aircraft pick-up and clamp actuators. Dual Ricardo ‘R-Cube’ electronic controllers manage the forces applied to the nose landing gear as well as vehicle speed and all the communications with the customer’s electronic systems for navigation, speed setting and control tower integration as well as the operational logic of the vehicle systems and the pilot interface. 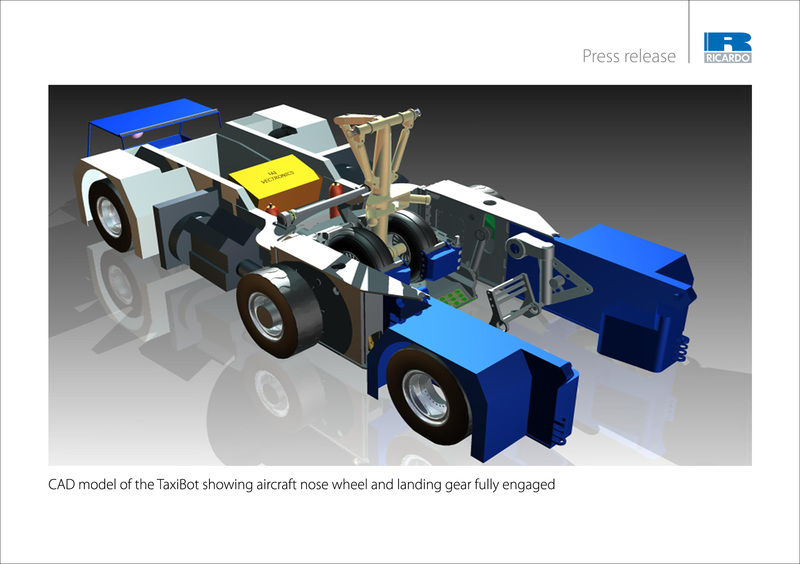 On engaging with the TaxiBot, the nose wheel of the aircraft enters the vehicle turret and is quickly clamped securely into position. The turret is able to rotate freely and can hence take steering and braking requests directly from the nose wheel in such a way that the pilot should not notice the presence of the tug whilst being towed normally by TaxiBot. 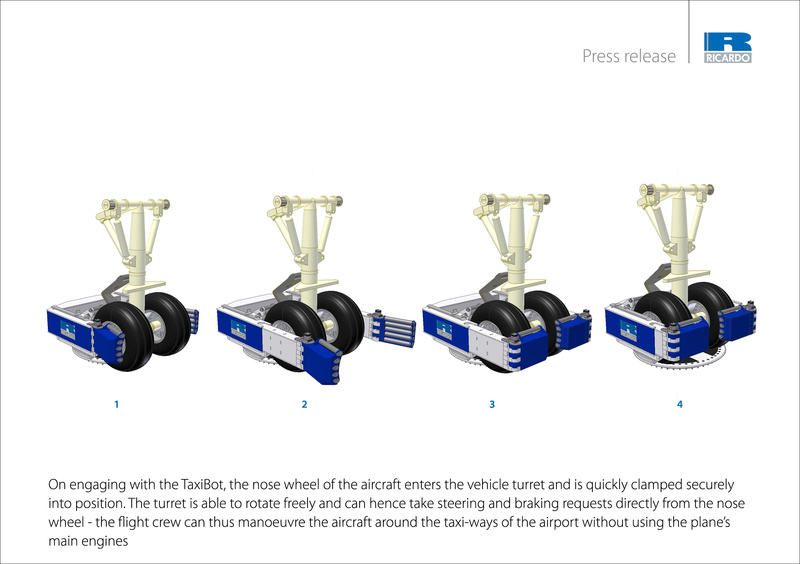 A crucial aspect of the TaxiBot design is that the aircraft brakes slow the aircraft down, not the tug. This, coupled with the management of the nose landing gear forces makes operational towing possible. With the TaxiBot engaged the flight crew can manoeuvre the aircraft around the taxi-ways of the airport, relying solely on auxiliary power units for on-board power and air conditioning needs. To orchestrate the technology, IAI has developed and provided a “high-level” vehicle controller that will integrate with airport control towers and provide speed target, towing force and other mission data while constantly monitoring geographical position. While the current prototype assumes that an operator is present in the vehicle, the control architecture of the vehicle is already in place to support autonomous tug operation so that in the near future no tug driver would be needed for taxiing. 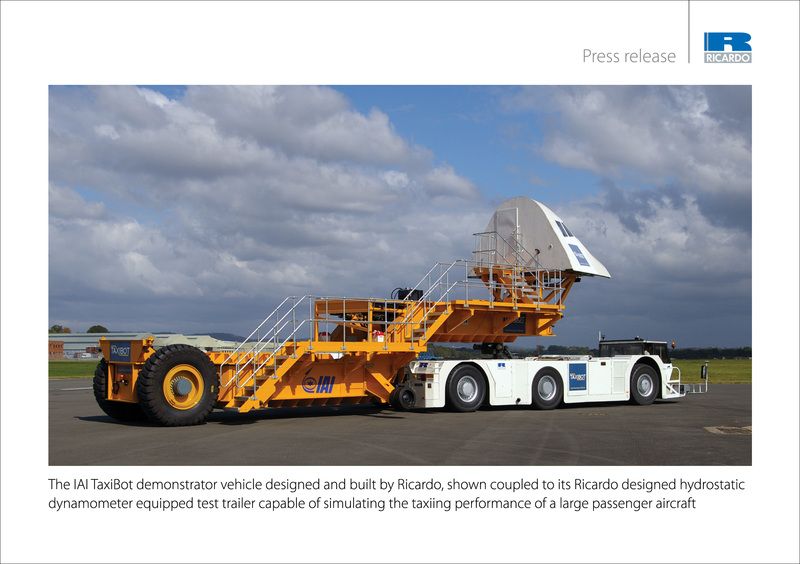 Ricardo has designed and built, in parallel with the vehicle programme, a 100 tonne test trailer equipped with a hydrostatic dynamometer capable of simulating large passenger aircraft tyre drag. The test trailer is designed with a genuine Boeing 747 cockpit and nose landing gear in order to fully replicate the processes both of towing and flight deck control of the tug. 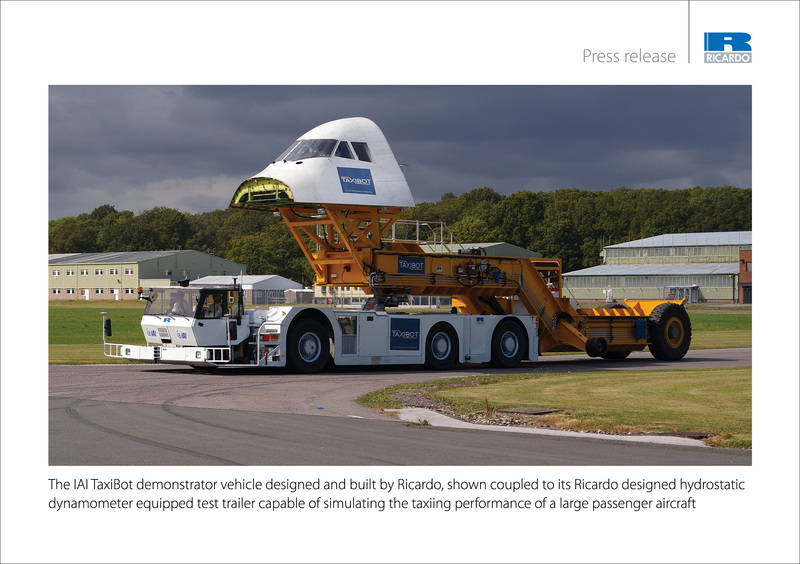 This highly flexible test trailer has enabled extensive testing of the prototype TaxiBot vehicle to be carried out by Ricardo at the Dunsfold aerodrome close to London, UK. 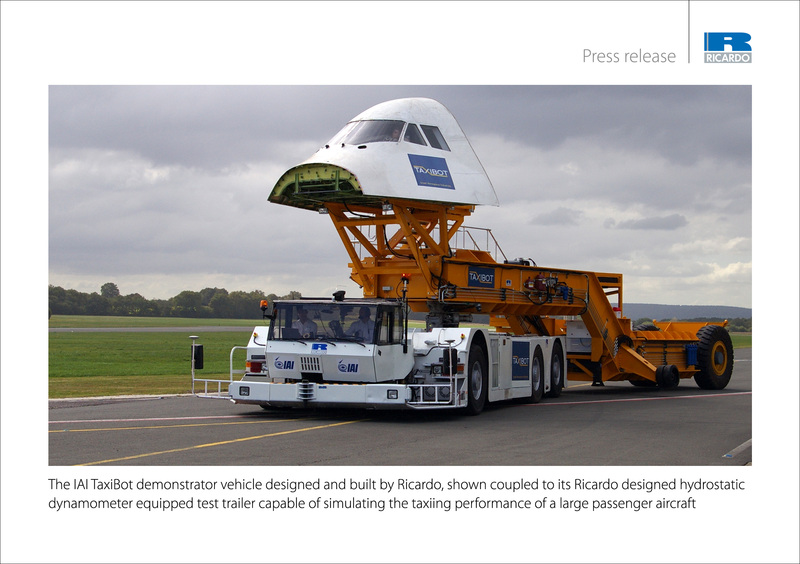 Following signature of the Memorandum of Understanding between IAI and Airbus Industries on future development of TaxiBot at the 2009 Paris Air Show, and subsequent Memorandum of Agreement with TLD, development tests are continuing to be carried out by Ricardo using the demonstrator TaxiBot vehicle and test trailer at Dunsfold. 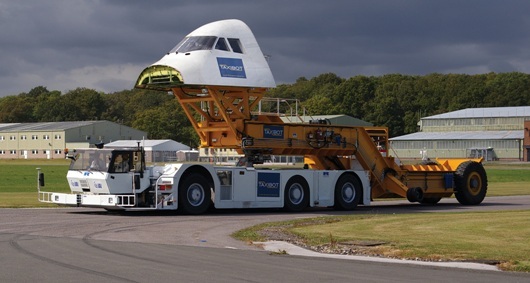 Once this testing is completed it is planned that the demonstrator vehicle will be shipped to Toulouse airport where the TaxiBot will be used in further tests in February 2010 with an Airbus owned A340-600 airplane weighing approximately 350 tonnes. The Ricardo team on the TaxiBot programme will continue to support the development work throughout this next phase based at Toulouse. High resolution images and a pdf copy of this press release are available from the downloads links to the right of this page.